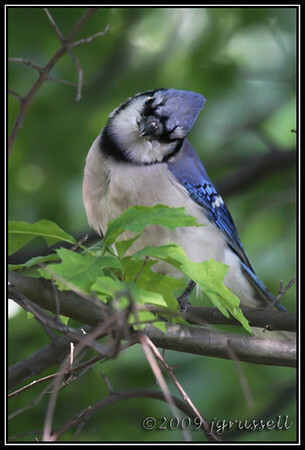 The blue jay sat and watched me this morning from the branches of a tree not far from the bird feeders. He won’t sit still any closer… at least not yet. This entry was posted on Monday, June 1st, 2009 at 10:09 pm and is filed under Photography. You can follow any responses to this entry through the RSS 2.0 feed. Both comments and pings are currently closed.